The appearance of German PzKpfw V ‘Panther’, PzKpfw VI ‘Tiger’ and PzKpfw IV fitted with a long barrelled 75 mm cannon on the battlefields of the eastern front posed quite a challenge for the designers of the Russian T-34 medium tank. Since the new generation of the German panzers completely outgunned the original T-34/76 variant, Russians hastily sought a solution to counter this problem. In May 1943 the State Defence Committee of the Soviet Union decided to fit the T-34 with a cannon of larger calibre. The final choice fell on a 85 mm cannon. 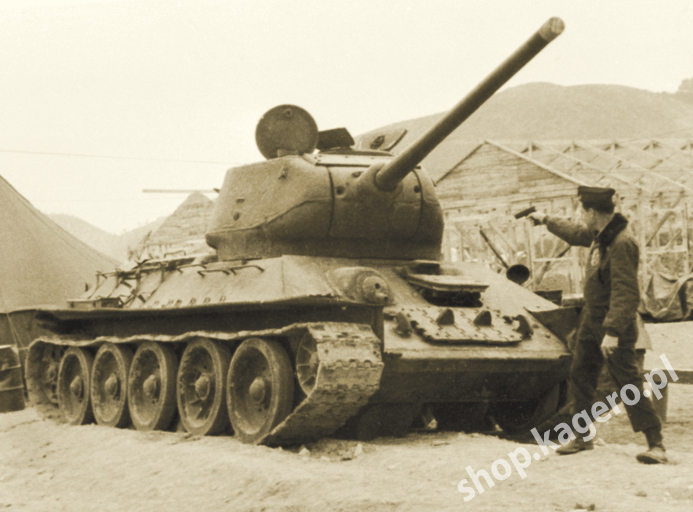 The first upgunned T-34s were coupled to the D-5T cannon; their production figure totalled some 800. This modification brought along a revised, enlarged turret and a more numerous, now five-member crew. The production of the redesigned T-34 commenced in early 1944 at Krasnoye Sormovo Factory No. 112 in Gorki. Meanwhile, a new, improved 85 mm ZiS S-53 gun was rushed into production. Henceforth, it became the standard main armament of all the newly built T-34s. With time, the rest of the factories assembling T-34s switched to production of the new variant. Overall, a staggering 18,000 T-34/85s were built by the end of the war. Interestingly, due to varying degree of manufacturing limitations of these plants, tanks of various production runs differed considerably. The first unit of the Polish People’s Army (the LWP – Ludowe Wojsko Polskie) to receive the new tanks was the First Armoured Brigade. On 1st October 1944 the LWP was issued 20 T-34/85s manufactured at No. 112 plant in Gorki, of which 15 went to the First Armoured Brigade. By the end of the Second World War a total of 328 upgunned T-34s were delivered to the LWP, mostly the production of the No. 112 plant in Gorki and No. 183 plant at Nizhny Tagil. Of these, only 132 survived the war. 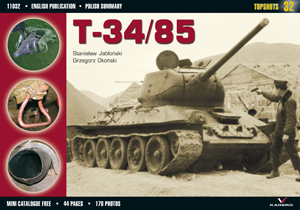 In 1951 Poland started a licence production of modified T-34/85s. Until the early sixties they were the main offensive force of the Polish armoured units, before they phased out in favour of the more modern T-54s and T-55s.